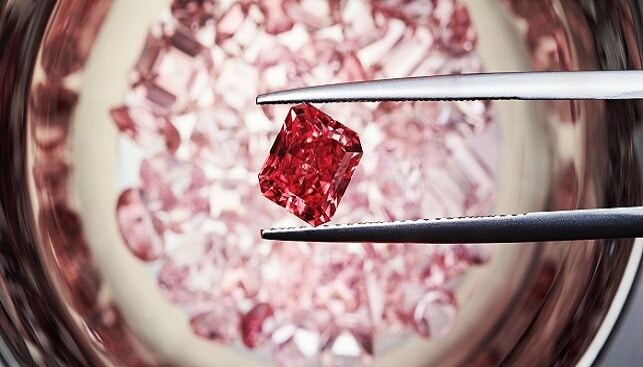 True red diamonds are the rarest of all natural colored diamonds. Most often, these stones are Type IIa diamonds with an imperfect crystal structure, which gives them their red hue. Fewer than 20 natural certified red diamonds are known to exist, and unlike other colored diamonds – which can weigh many hundreds of carats in their rough form and even after cutting and polishing exceed 100 carats – no red diamond has a carat weight of over 5.11, and only three red diamonds in existence weigh over 5 carats. The largest red diamond known today is the Moussaieff Red, originally known as the Red Shield. The 5.11-carat trilliant-cut stone was discovered in Brazil in the 1990s and weighed 13.90 carats in the rough. Its cost as of 2002 was estimated at $8 million, which would put its per-carat value at over $1.56 million – a figure that would likely be even higher if the diamond were sold today. Mistaken at one time for a garnet, the 5.03-carat round brilliant De Young Red is the third-largest red diamond in existence. The diamond, named after its previous owner – Boston jeweler Sidney De Young – is now part of the National Gem and Mineral Collection at the Smithsonian Institution. 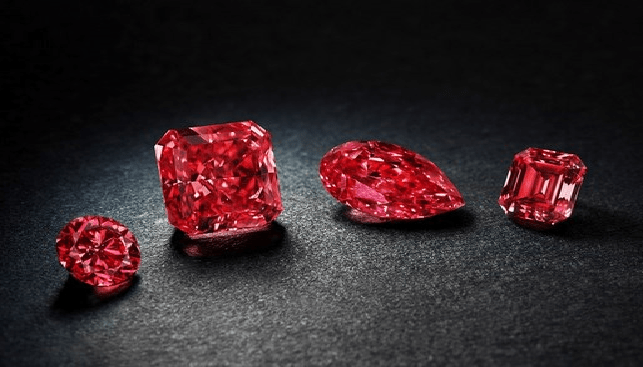 The fourth and fifth-largest red diamonds are the Graff Purplish Red, a 2.26-carat octagonal brilliant stone; and the 1.92-carat Unnamed Red.